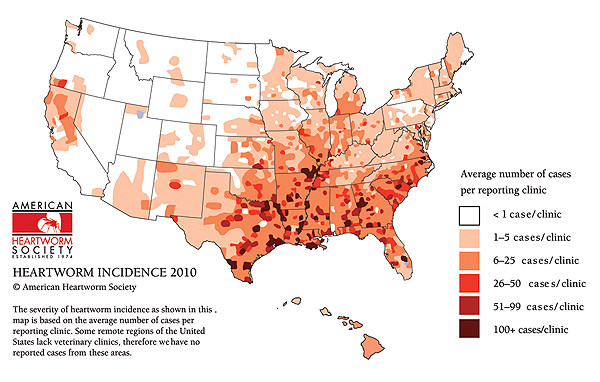 The American Heartworm Society has just released an updated Heartworm Incidence Map showing last years cases. While we are thrilled to see there has been a reduction of case throughout the country we were horrified to discover that Houston is still one of the highest ranking for Heartworm cases in the country. Come on Houston, lets show the rest of America we love our dogs enough to keep them safe. Please read my previous post here to see how you can prevent Heartworms. 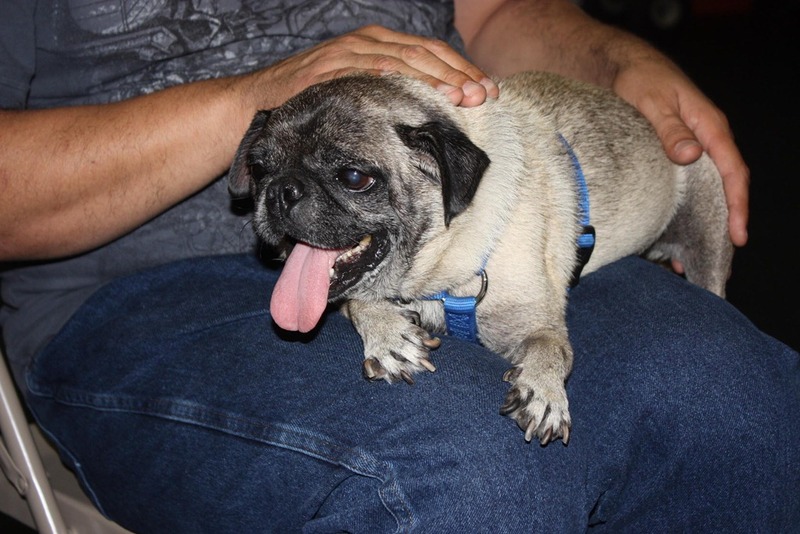 I’ll never forget the fear and anger I felt in 2005 when my vet told me my newly-adopted pug, Chucky, was heartworm positive. Since I’ve been involved with PugHearts we have taken in and treated hundreds of HW+ dogs, and I personally have cared for half a dozen pugs who have gone through the treatment. It has never become routine for me, and I am angered each and every time. This disease is totally preventable! Monthly heartworm preventative costs so little compared to the treatment costs. 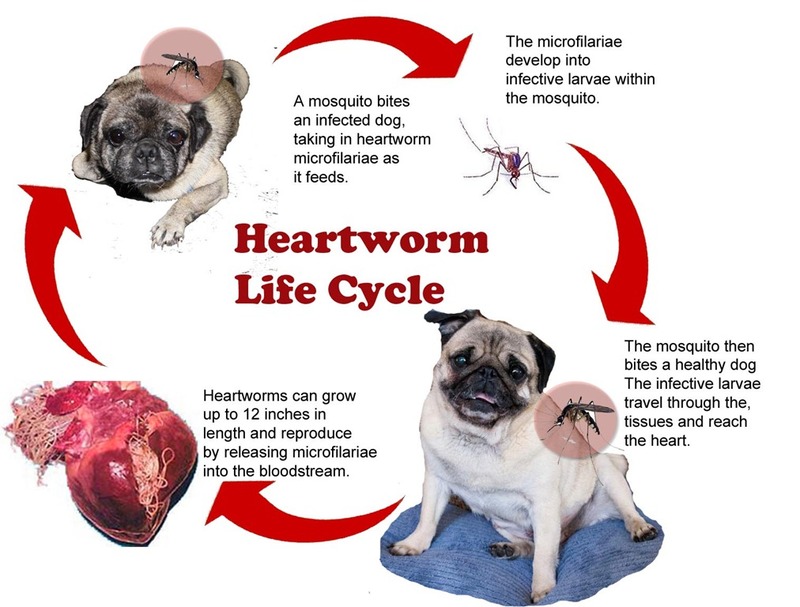 Heartworm disease is caused by the parasite, Dirofilaria immitis. 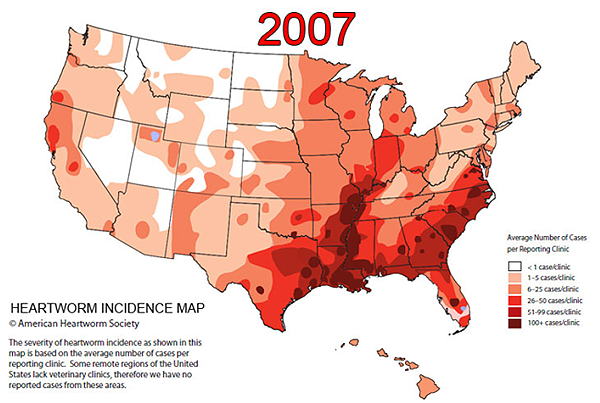 It is transmitted by mosquitoes and has been found in every state in the US. It only takes one mosquito bite for your dog to get heartworms and, without prevention; there is a 100% chance your dog will get it. Last weekend we had an adoption event at Rover Oaks and I met an adorable little guy called Ricky. This tiny little guy is severely heartworm positive, with an enlarged heart. It broke my heart to watch him struggle to breathe. This was much more serious than the cough we usually see as the first symptom. The way a dog becomes infected with these parasites is the stuff of nightmares. Infected dogs are the breeding ground for the next dog to become infected. When a mosquito bites an infected dog, it ingests immature heartworms known as microfilaria. Microfilaria is the larval form of heartworms that change within the mosquito to reach the third stage. It is the third stage that can infect your dog. When the infected mosquito bites your dog, it deposits third stage microfilaria on your dog's skin and the microfilaria enters the dog through mosquito's bite wound. The microfilaria then travel or migrate through the tissues (meaning skin, muscle, connective tissue) and mature to become a juvenile adult or fifth stage larvae. This process takes about 50-70 days in the dog. Sometime between 70 and 110 days after the dog is infected, the larvae reach the blood stream and end up in the arteries of the lung (pulmonary arteries). These juveniles then grow up to produce microfilaria of their own in about six months. Injury to the lining of the pulmonary arteries (pa). Pulmonary hypertension, or Increased pressure within the pa due to the presence of the heartworms, the thickening of pa walls, scarring and blockage of pa, and pieces of heartworm that lodge in pa or clots that form and lodge in pa (known as heartworm emboli). Pulmonary hypertension is then responsible for right sided heart disease, even right sided congestive heart failure. The severity of pulmonary hypertension is dependent on the number of adult heartworms, thus, the larger the number of heartworms, the more severe the disease. Changes within the lung itself. These changes include the infiltration of lung by eosinophils, a white blood cell that takes part in the immune response to allergy and parasitism. Eosinophils are capable of causing and perpetuating a severe inflammatory response which damages the lung and leads to scarring of the lung. Other white blood cells and inflammatory cells may invade the lung causing damage. The heartworms can actually block an artery (thrombosis) and, in areas where thrombosis has occurred, nodules made up of inflammatory cells known as granulomas may form. Vena Cava Syndrome. This syndrome strikes fear in the heart of every veterinarian. It can happen when there are excessive numbers of adult heartworms in the pulmonary arteries and the heart to the extent that they block blood returning from the liver and the back of the body. This results in severe pulmonary hypertension, the death of liver cells, and the destruction of red blood cells. Large numbers of adult heartworms can interfere with the closing of the valve on the right side of the heart (tricuspid valve) and cause increased speed of flow through this valve exacerbating these problems. Serious injury to other organs, especially the kidneys, due to the deposition of damaging immune complexes formed between heartworm proteins and antibodies the dog produces against them. There is a small supply available at Sugarland Pet Hospital, but small is the key word here. It will be reserved for special cases. Cindy and Dr Hendrix will work together to make decisions about which fosters will go through this treatment. What will the impact be for PugHearts? Heartworm positive fosters will have to wait longer before treatment and even potential adoptions may be delayed, meaning we will have more dogs to care for. What do we do when our small supply of Immiticide runs out? The American Heartworm Society supports a protocol using a combination of a heartworm preventative and doxycycline (an antibiotic) to manage infestation — a protocol the society is expected to release as as guidelines for practitioners on treating heartworm-positive dogs without Immiticide. Dr. Tom Nelson, a past president of the American Heartworm Society and a practitioner at the Animal Medical Center in Anniston, Ala., notes that the use of doxycyline in combination with heartworm preventive has been shown to reduce pathology, the number of adult worms and the infective potential of microfilaria in canine patients. Treating heartworm is tricky business. An infected dog, for example, must not vigorously exercise because an increase in heart rate raises the risk that fragments of dead worms in its blood vessels could cause thromboembolism — the formation of an embolism, in this case of dead worms — to the lungs, which usually presents as acute shortness of breath. The condition is treatable with steroids but may prove fatal. Nelson notes that Immiticide quickly kills worms, thereby shortening the time that a dog's exercise must be restricted. Slow-kill therapies, such as the use of heartworm preventatives, potentially allow for greater opportunity in which worms might block blood vessels, leading to worse lung problems. Exercise will need to be restricted during the duration of the treatment which may be over a year without Immiticide. So now, more than ever, it’s extremely important to keep your dogs on heartworm preventative and to give it monthly on a regular schedule! Lets all say a prayer for our heartworm positive rescue dogs, too. Heartworms. Is YOUR dog at RISK? Heartworms. That word should strike fear into the heart of every dog owner. They are insidious creatures, slowly and silently killing thousands of dogs in Houston and around the country every day. PugHearts takes in an extraordinarily large number of heartworm-positive dogs every year. It is especially prevalent in warm weather areas as they are excellent breeding grounds for mosquitoes who transmit the larvae to dogs when they bite them. If we lived in Alaska, for example, your dog’s chances of contracting heartworms would be cut drastically. But as we’re here in Texas, the chance of your dog contracting heartworms if it’s not on any preventative is extremely high. Think about how many times a year you are bitten by a mosquito or see one buzzing around you. Your dog will encounter these little vampires every time it is outside as well. 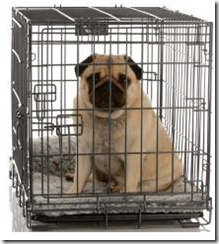 We hear owners say “oh my dog lives indoors so they aren’t in any danger.” Really? Do you live outside? No. But do you get bitten by mosquitoes when you do go out? Yes. Ever find a pesky mosquito buzzing around inside your house? Wake up and find that one has been feasting on you during the night? The same is true for your dog. But you won’t die from the heartworms because they do not survive in your bloodstream. It’s just a sad twist of fate that the dog’s bloodstream is so compatible for these horrible creatures. And sadly, there is a severe shortage of the medication used to treat heartworms right now. The manufacturer, Merial, has announced the medication is temporarily unavailable and they have none in stock. Our vet (as well as all vets around the country) is unable to get anymore in right now to treat heartworms. PugHearts has a small amount in stock and we will have to make decisions about treatment on a case-by-case basis. However, the fantastic news is that heartworms are completely preventable! With simple, once-a-month medication, you can help prevent your dog from ever contracting heartworms. There are many medications to choose from. Pills/chews include Heartgard, Tri-Heart, Iverhart, Interceptor and Sentinel. Topical medications such as Revolution and Advantage Multi will also prevent heartworm infestation. All of these medications are effective against some worms and many of these also prevent fleas. Most of these come in multi-packs, so you can buy a 6-month supply in one box. What is the cost? Well, that depends. These medications are all sold in dosages based upon your pet’s weight. 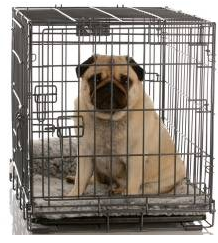 As pugs are relatively small dogs, if their weight is maintained at a healthy level you should be able to get away with the “under 25 lbs” dosage – which happens to be the cheapest. If not, the next level up isn’t much more expensive and that will take care of dogs up to 50 lbs in weight. If your pug weighs more than that – you should call Guinness World Records ‘cause that’s unbelievable! A 6-month supply of Heartgard will run around $40 from your vet. Iverhart will be around $30. Revolution and Sentinel will run just over $100 (but remember they also kill fleas and treat ticks, worms and ear mites.) You can also order these online for a little less, but will have to have your veterinarian authorize that. It is a prescription medicine because your vet wants your dog to have an annual heartworm test. Once you get that negative result, they will write you a year’s prescription. Okay, so what happens if it’s time for your dog’s heartworm medication and you’re strapped for cash? Please do not even think about “skipping” a month! It is a monthly treatment because the effects of the drug only last for 30 days. If you skip a month, your dog will NOT be protected, even if they had their pill every month prior for the last 2 years. So please talk to your vet about how to get your dog covered. Maybe your vet can offer a generic alternative to the more expensive brand name. If not, your vet will be happy to let you buy the medication in a one-month dose instead of paying for 6 months all at once. That means for less than the cost of a Happy Meal, your dog will be protected from heartworms for another month. Now THAT’s a value! Please, we cannot stress it enough, make sure your dog is on a heartworm preventative. It really is a matter of life and death.